At some point last year, I figured out that it was possible for us to visit our 900th brewery on our 25th wedding anniversary. 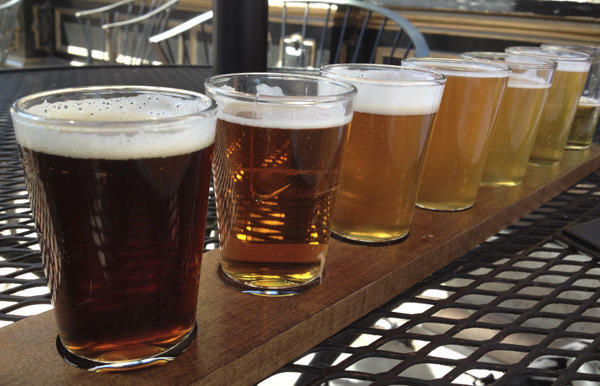 For beer travelers like us, nothing could be more romantic. With this idea stuck in my head, the challenge became making it happen. On the eve of our silver anniversary, we woke up in Nashua, NH. Somewhat out of the norm for our beer travels, I planned a leisurely day that would end in Portland, ME. And with the first brewery visit in Nashua itself, we even had time for a pleasant walk through the town’s park, Mine Falls. 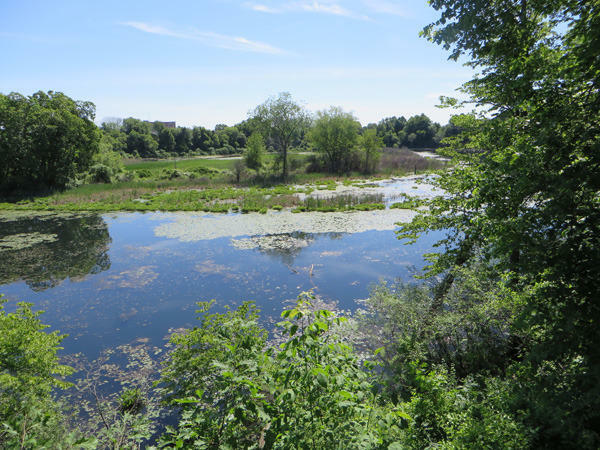 Despite the relaxing start to the day along the Nashua River, there was a nervousness in the air. Well, at least I, as the planner, was nervous. To reach 900 breweries the following day, Merideth and I needed to visit all breweries on the day’s itinerary. 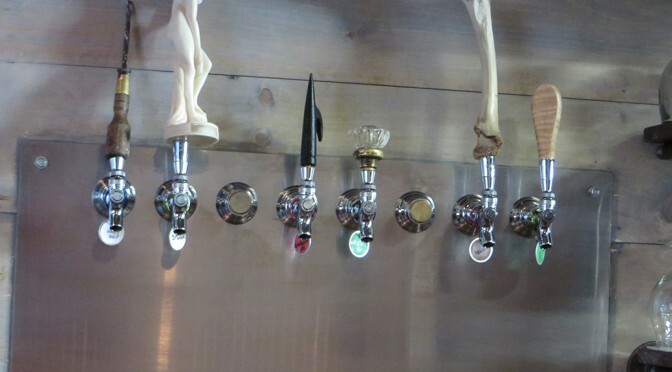 There was no wiggle room, no plan B breweries to visit if one was unexpectedly closed. Something often goes awry on our travels and this day had to go perfectly. With that air of tension of what our day would hold, we finished our walk and drove the few blocks to downtown Nashua and our first beer stop of the day, Martha’s Exchange. Despite the slight tinge of heat and humidity we passed on the air conditioned brewpub and chose a well-shaded table outside. 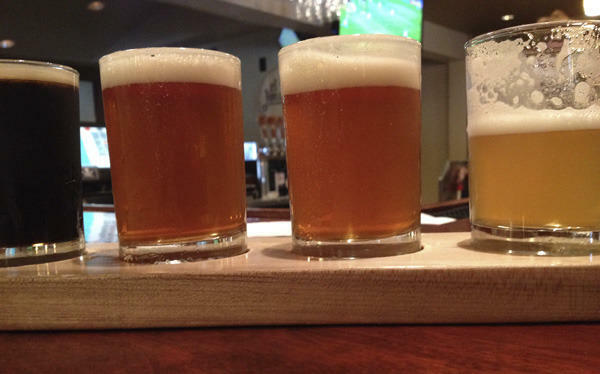 With lunch plans already sorted, this was just a taster flight stop, which we quickly ordered. Eight samples were soon in front of us. One of the more diverse set of beers we have tried recently, the octet of brews ranged from Volstead ’33’, a Golden Ale, to Velvet Elvis Vanilla Stout. In between there was an Alt, Saison and requisite IPA to name a few. It was probably the weather talking but the refreshing, easy drinking Golden Ale stood out for me. The hopping reminded me of a German Helles, a style I really love. For Merideth, the peppery, dry Consortium Saison was her standout. Eager to press on, we didn’t dawdle once we finished our sample flight. We quickly left Nashua in the rear view mirror heading across New Hampshire. 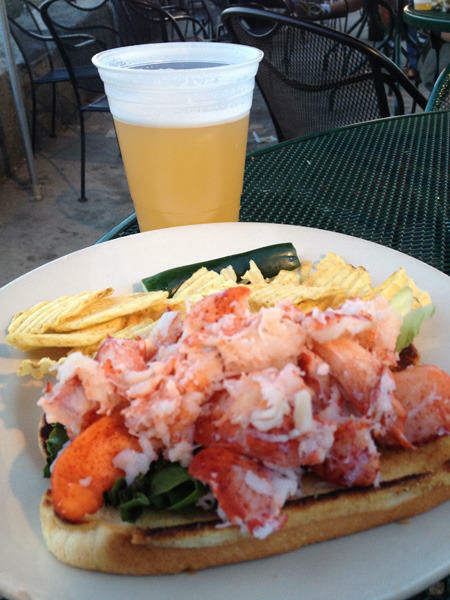 For those who know of our previous New England travels, lobster and especially lobster rolls are as important as beer. Heading towards coastal New Hampshire on our way to Maine, it was time to indulge in our second passion. Despite its touristy appearance, pre-trip research pointed to the Beach Plum in Portsmouth as the stop for our first lobster roll of the trip. 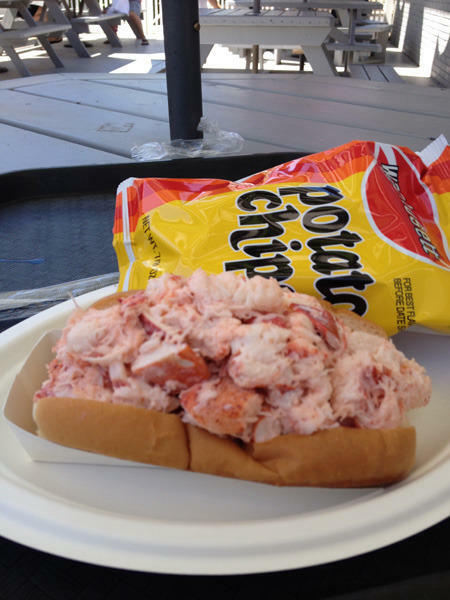 Its location on our route and award-winning lobster rolls made it an easy choice. Choice confronted us as Merideth and I stood in front of their extensive menu. Six versions of lobster roll were available including a 20oz., foot-long monster. Romance aside, we decided on the non-sharing route, each choosing the 10oz. version. Same amount of lobster meat, no competition or hurt feelings. Preferring our lobster rolls naked, the light coating of mayonnaise was distressing to see at first. But they were quite yummy and were a worthy first roll of the trip. 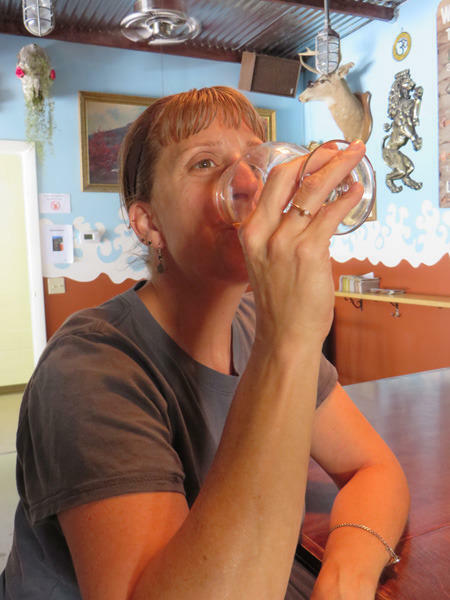 It was a short drive up the road to downtown Portsmouth and maybe the surprise brewery of the trip, Earth Eagle Brewings. While I sorted the parking situation out, Merideth went into the tiny tasting room and ordered the six beer sample flight. When I finally sat down to sample, Merideth was already several tastes in. Grabbing my first taste, Sputnik, a Pale Ale, Merideth said something about gruits. Not a gruit guy, I didn’t really pay attention until she added that three of the six samples were of the hop-free variety. Never having tried three gruits at once, curiosity got the best of me. Ignoring the two IPAs (which ended up both being excellent), I delved into Barelyberry, Exhilaration and Birthday Boy. Though not a fan of the style, I could still appreciate the quality that went into the brews. I also liked that they had a forager who gathered the herby ingredients. The latter two were more what I associated with the style, earthy and herbaceous. The first, Barelyberry, Merideth’s favorite in the set, as its name suggested, employed blackberries in the brew. A candidate for beer of the trip was not in the sample flight. Madame Trixie, their current barrel release, was a Blood Orange, Black Pepper Saison with Brett. If that wasn’t enough, Madame Trixie was aged in Allagash Curiuex barrel for 14 months. A sucker for beers with black pepper, despite what all was going on in the brew, it all worked together deliciously well. Crossing over into Maine, we found the final new brewery of the day in the beachside town of Wells. Hidden Cove Brewing at Fire N Brew didn’t open for another hour. Confidence was high that it was opening, so that stress I had been feeling all day went away. With time to kill, Merideth and I backtracked to Wells Beach Mini Golf. 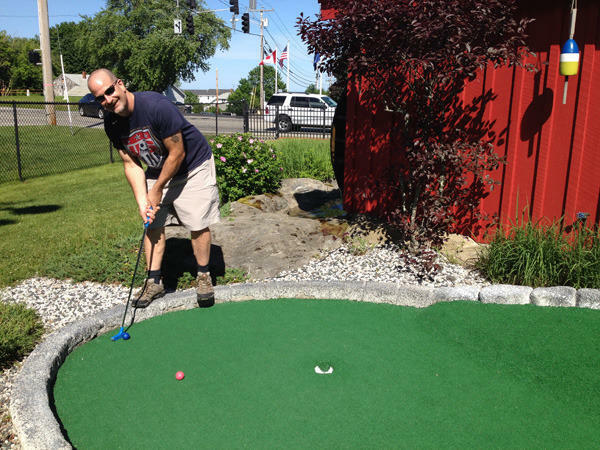 It was a beautiful Maine afternoon for a round of mini golf. Unlike previous times we have played, Merideth rode a strong short game on the front nine to finish +2, a surprising seven stroke lead over me. Her only mistake was to hit the ball out of bounds, a one stroke penalty. This was to prove costly. The back nine played more true to form with myself slowly eroding Merideth’s sizable lead. My par and her bogey on the last hole sealed my comeback, both of us finishing with the identical score. Despite our normal competitiveness, we thought it quite romantic on the day before our 25th anniversary. The mission of the day is accomplished! Back to Fire N Brew, we bellied up to the bar and chose four beers, Summer, Scully, A’Rye and Crowsfoot, from the five offerings for our sample flight. First things first, Merideth and I each grabbed a sample glass and toasted the important goal of the day being successfully completed. 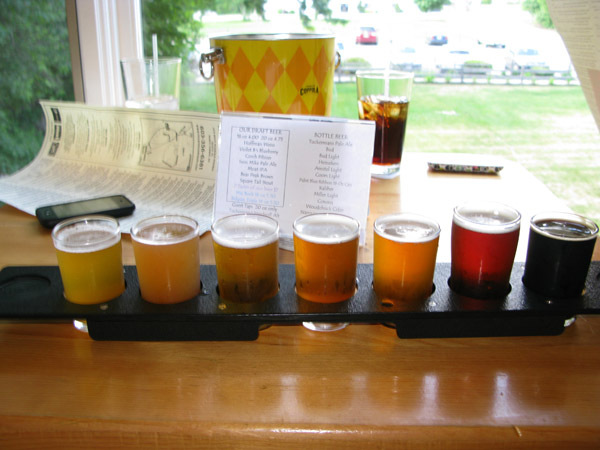 Eager to get to Portland to watch the USA v. Ghana World Cup match, Merideth and I didn’t really dwell on sample flight. Our loss, since Hidden Cove was doing some interesting things in the brewhouse with local ingredients and wild yeasts. We’ll give it a proper visit on our next trip to Maine. In Portland, I was finally able to let my hair down. After catching the inspiring USA victory over Ghana in the Old Port, we moved on to our traditional activities. First up was a lobster roll and Allagash White at J’s Oyster followed by a Maine Beer Company nightcap at Novare Res. A great ending to a productive day! Our hike above Stowe was only a warmup for the main hike of our trip, New Hampshire’s Mt. Washington. 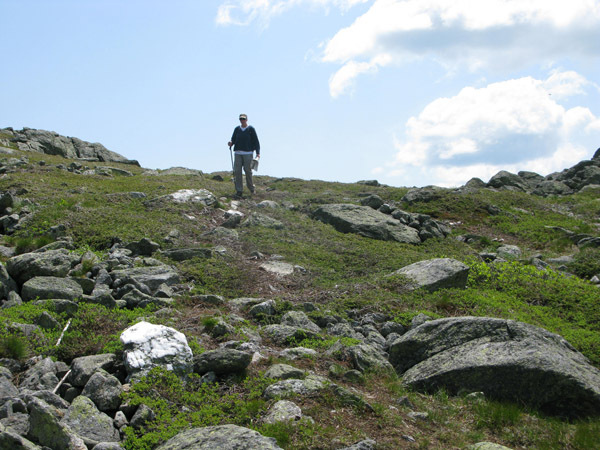 Prior to our trip, I researched the trails that lead to the the highest peak in New England and surmised we probably didn’t have the time nor the stamina to reach the top. 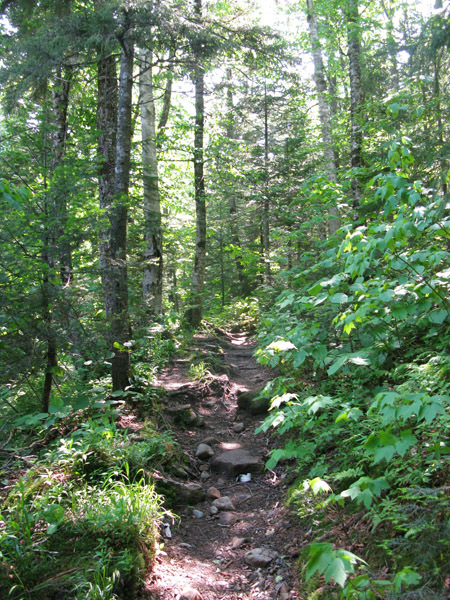 But the network of trails below the summit looked like they provided plenty of opportunities to enjoy the most famous of the White Mountains. The day dawned the nicest of the trip with only a few clouds in the sky. We parked at the Cog Railway base station and purchased a trail map in the gift shop to guide us on our hike. Merideth and I looked over the map. From our starting point, we only had two trails to choose from. We decided the Ammonoocuc Ravine Trail, at 2.4 miles, looked like the perfect hike for us. The deciding factor was that the trail terminated at the Lakes of the Clouds hut, a reminder of the Alpine beginnings of Hike-n-Beer. Hike-n-Beer originated on our first Alpine adventure, a hike above the Königsee in Bavaria. Merideth and I walked for over two hours on this quite vertical trail. When we reached a clearing, I saw a small building with a beer sign on it. To good be be true, in fact this little restaurant served simple plates of bread and cheese but more important, beer. It was a special moment as two of our passions were married. The Ammonoocuc Ravine Trail started out innocent enough, lulling us into a false sense of ‘this is going to be a piece of cake.’ We strolled through the forest, with the trail having a gentle and easy up slope. As we checked out all the flowers, streams and waterfalls, Merideth and I pondered whether the hut would have beer. We joked that the hut would probably have beer, but our choices would be Bud or Bud Light. That’s the same as having no beer at all we surmised. About halfway into the hike, the trail changed drastically. The gentle slope turned steep. The soft forest floor trail turned to boulders. Our pace slowed dramatically as we scrambled over the boulders, criss-crossed the Ammonoocuc River and took frequent breaks. The saving grace was that we were still protected from the sun by the forest cover. Despite the change, we were still chipper enough two thirds into hike to detour 100 yards off the trail and check out the Gorge with it’s awe-inspiring view and waterfall. The last section of the hike was the hardest where the trail follows the river up the steep face of the hill. Adding to the difficulties of this section was we were no longer under cover of the trees and feeling the full force of the sun. 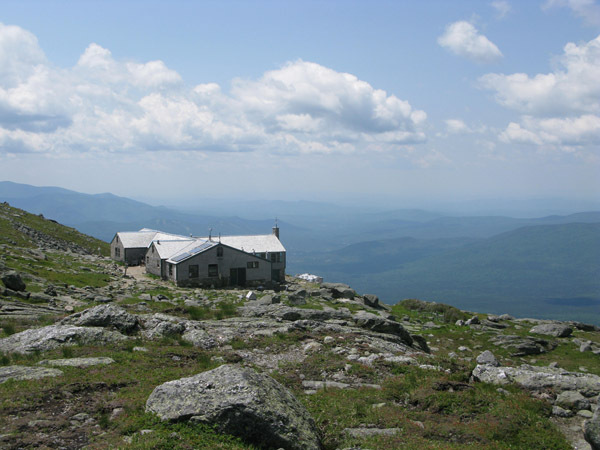 Two and a half hours after setting off from the Cog Railway, Merideth and I finally reached the hut. We were both exhausted. Sitting in the hut dining room, we quickly tried to rehydrate and eat our snacks. There was no beer. We still had to get back down the mountain. I couldn’t picture myself going back down the trail we came up. And it wasn’t just because I hate going back the way I came. The pounding we would take didn’t seem like much fun. So we plotted a course across the face of the mountain down a trail that would hopefully be easier. 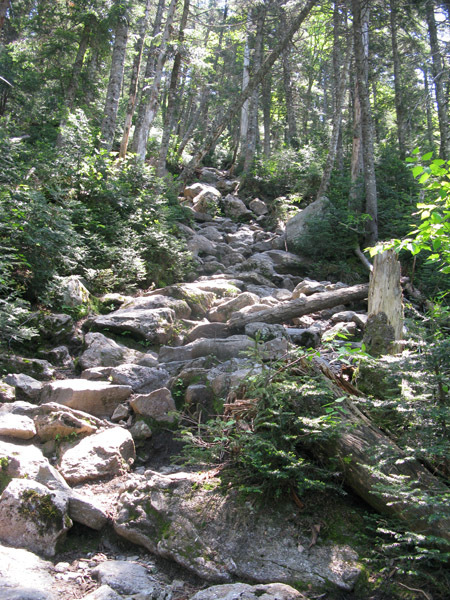 The trail across the face was certainly easier but still strewn with boulders. In our tired state, this type of hiking took a lot out of us. We couldn’t just walk with our normal strides. We had to concentrate all the time and place each step carefully. The route took us within 1/2 mile of the summit. Part of me wanted to make a go, but I knew that was a stupid idea. 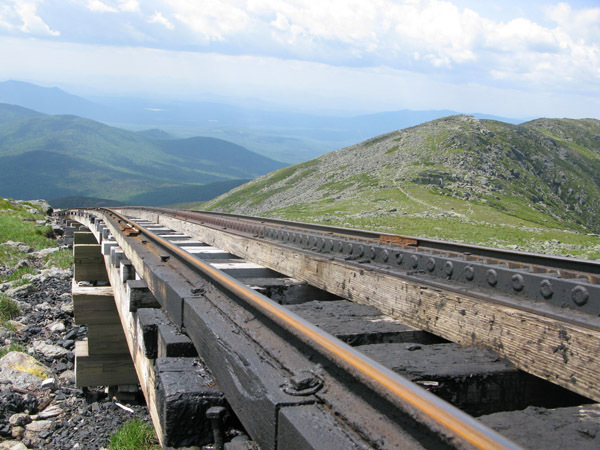 We finally reached the Jewell Trail, our link back to the Cog Railway base station and our car. Probably 75% of it’s 2.6 mile length was exactly the type of descent I was trying to avoid by going back down the Ammonoocuc Ravine Trail. Scrambling down rocks and boulders, our bodies ached after each step. Plus, legions of bugs constantly harassed us every step of the way. Six and a half hours after departing, we made it back to our car. We covered over seven miles and ascended then descended 3,000 feet. The difficulty of the hike ranked up there with any we have done in Alps. We really needed a beer after such an effort on the trails. 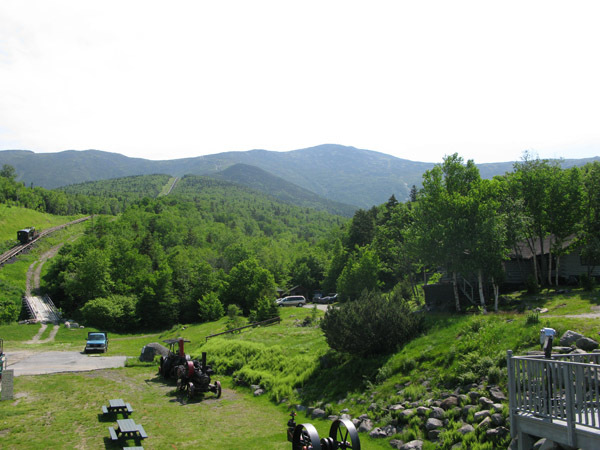 Unfortunately, the beer portion of Hike-n-Beer was a half hour drive away in the town of North Conway. The anticipation for that first beer was excruciating. 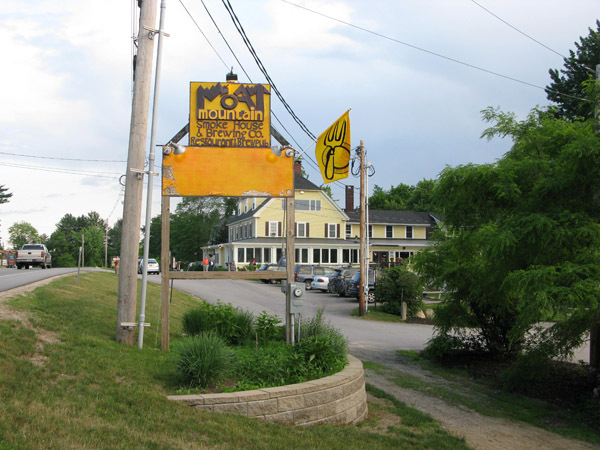 Moat Mountain Smokehouse and Brewing Company was located on the main highway that goes through the town. Our chief worry as we parked was Game 7 of the Stanley Cup Finals started in a few hours. Would the bar already be too packed with eager Bruins fans? Much to our relief, the bar was crowded, but nowhere near packed. We grabbed a high table away from the noise that had a nice view of the countryside and mountains. Like two people who had been stranded in a desert, we quickly ordered a taster set of the house brews. There were seven beers in the set. The first two, Hoffman Weiss and Violet B’s Blueberry, were both very refreshing brews. The Hefe had that really nice banana/clove aroma and flavor. However, like many American Hefeweizens, the Weiss was under-carbonated for my tastes. Violet B’s had a subtle, dry blueberry taste. However, the strangest beer had to be the Czech Pilsner. It had the familiar Pils flavor at first but had an overwhelming marijuana finish. The best beer was Bear Peak Brown, one of the best Brown Ales we have ever tried. It had a wonderful nuttiness to it. Over dinner and pints, Merideth and I relived our day on Mt. Washington. Despite the difficulty, it was an amazing day. While we disagreed on the enjoyment level, this hike will go down as one of the classic editions of Hike-n-Beer.